2” x 72” 220 Grit ceramic sanding/grinding belts. Pack of 6. Closed coat, x-flex waterproof cloth backing. Top coat reduces heat, buildup, and allows for cooler grinding. Ultra strong and precision built bi-directional tape joint allows belt to run in either direction. 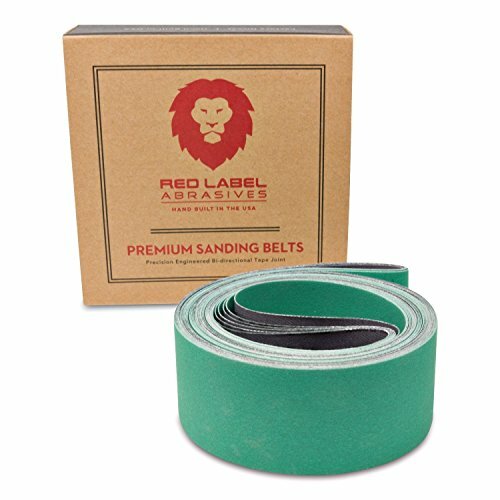 Ceramic sanding belts provide the longest lasting cut on non ferrous metals (aluminum, copper, titanium, nickel) and ferrous metals (steel, stainless steel, pig iron, alloys, hardened steel). use for sharpening, grinding of welds, shaping, cutting and blending metals. Also works for dense and hard woods. Significantly longer life when compared to aluminum oxide and Zirconia abrasives. Resin over resin bonding. Anti-clogging stearate (provides a better sanding and cleaner working environment). wet or dry applications. Assembled in America.